From the Beaver Valley we drove a short distance to the pretty country town of Thornbury, which is located where the Beaver River flows into Georgian Bay. 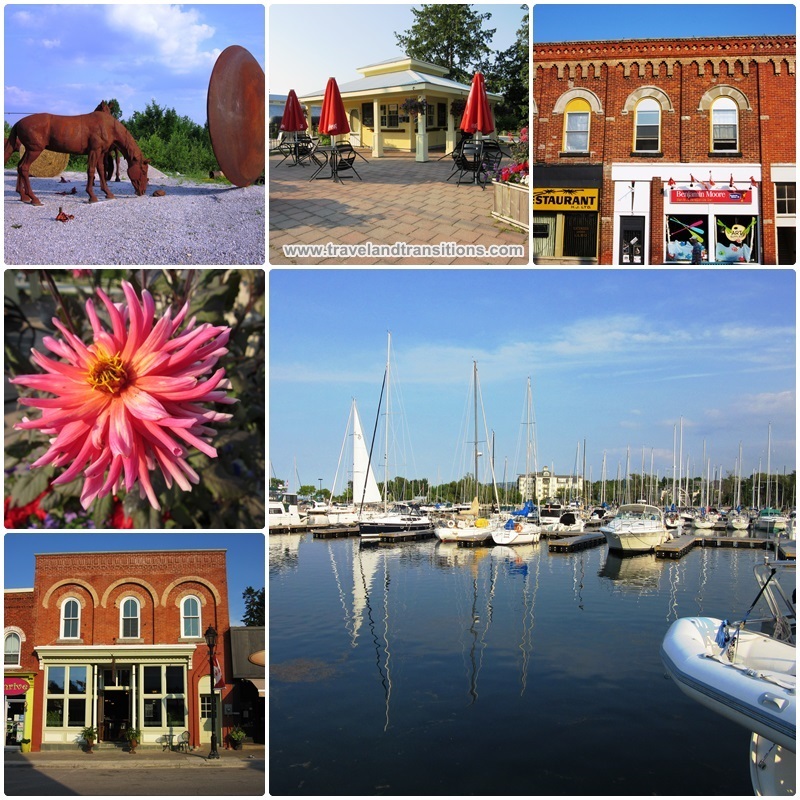 Thornbury has an attractive harbour area with a marina that can accommodate 250 boats. Two beaches in the area have been awarded Blue Flag status for their outstanding water quality and overall environmental management. A nice ice cream parlour sits on the hill just above the harbour. And just up the street is a historic downtown with numerous Victorian-era buildings that now house various shops and restaurants. Thornbury has two golf courses, the Tomahawk Golf Club and the Lora Bay Golf Club, which has a magnificent location overlooking Georgian Bay and was designed by PGA professional Tom Lehman. Famous players such as Colin Montgomerie, John Daly, Retief Goosen and Stephen Ames have played here. With its vicinity to the Niagara Escarpment, there is also great hiking and skiing near Thornbury, making it a four-season getaway destination. Cyclists will enjoy the Georgian Trail, a former railway line from 1872 that has been turned into a multi-purpose recreational trail whose 32 km long path connects Collingwood via Thornbury with Meaford. 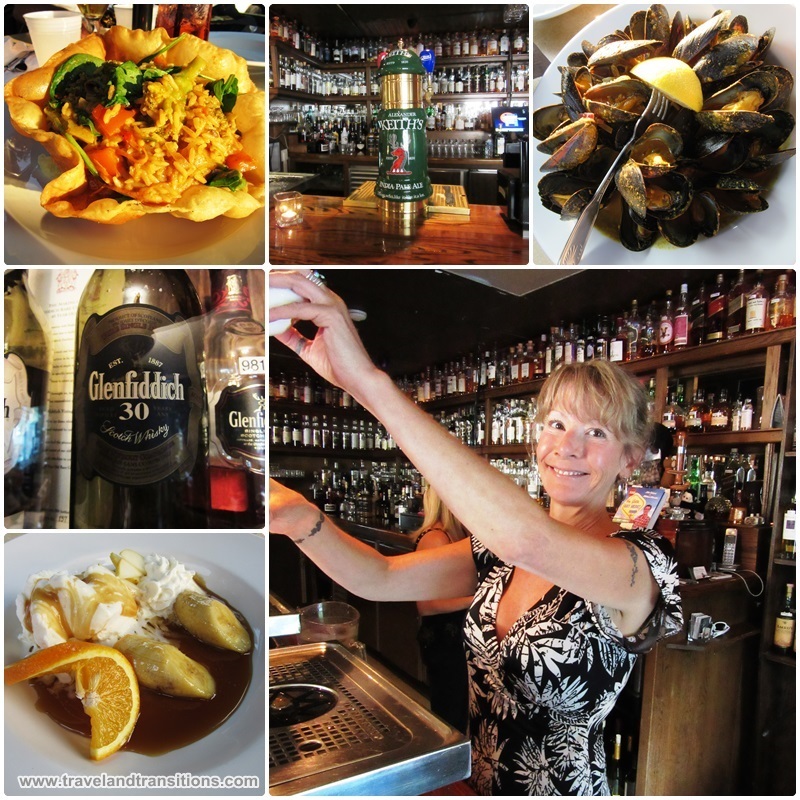 One of Thornbury’s most popular eateries is the Dam Pub, a gastro pub that is famous for carrying over 600 whiskeys from around the world including more than 300 single malts. The Dam Pub is located inside a historic Victorian-era mansion that was built around 1875 and has dining areas on both the main and the upper floors. Outside is a gorgeous large patio that is surrounded by a fence with overflowing flower baskets which is where we sat down for dinner, soaking up the warm evening sun. 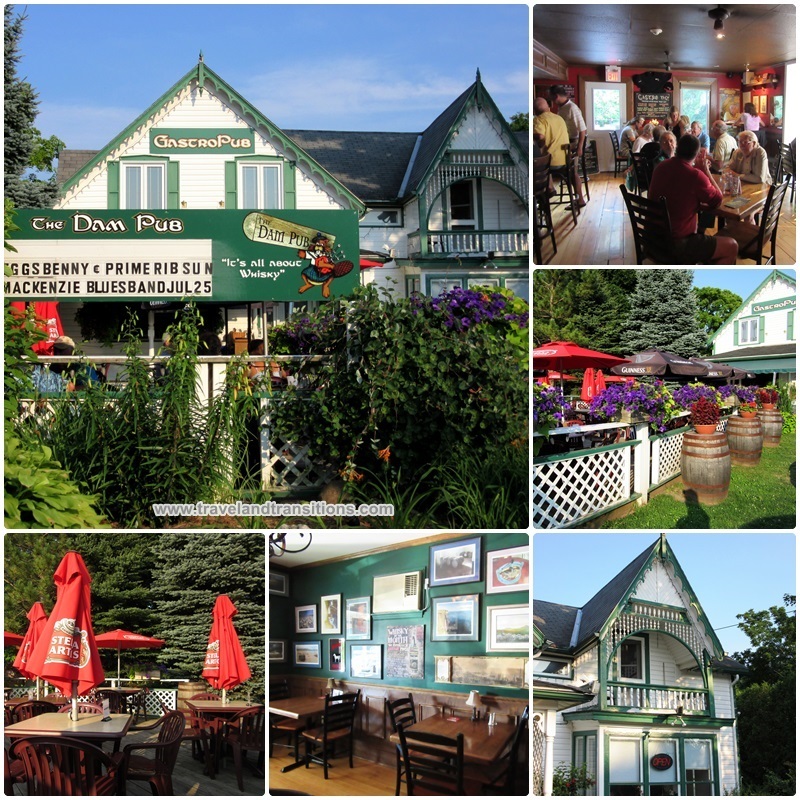 The Dam Pub was created by Stephanie Price and her parents Sandy and Gordon Price to provide a true Scottish experience in one of Ontario’s most popular getaway regions. We were looking forward to a tasty meal prepared by Executive Chef Suzette Gerrie whose famous dishes include Fresh Georgian Bay Whitefish, braised Lamb Shank, Steak and Kidney Pie and many more. Some of the Scottish favourites at the Dam Pub include Deep Fried Haggis; Haggis, Neaps and Tatties, Bangers & Mash and Shephard’s Pie. Our first evening in Grey County came to an end with a pleasant dinner on the patio of the Dam Pub in Thornbury. The menu features a wide variety of traditional pub-style meals mixed with sophisticated dishes that will please any urbanite’s palate. 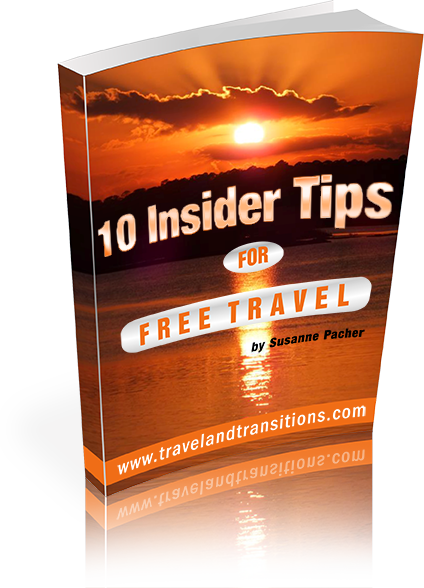 I started with the soup of the day – a scrumptious Butternut Squash Sweet patio soup, and followed it up with Curried Vegetables and Rice, which came with a perfectly balanced Thai coconut curry sauced served in a toasted tortilla bowl. My friend couldn’t get enough of the mussels. On Mussels Monday, mussels were available with three choices of broths: white wine, garlic & thyme; tomato and fennel; and cinnamon and Guinness. The white wine, garlic and thyme mussels were so good that my friend followed up them with an extra portion of Fresh P.E.I. Mussels in a Thai coconut curry cream. Executive Chef Suzette Gerrie had demonstrated her culinary art on this Monday. Although I was already thoroughly stuffed I could not resist the Banana Foster for dessert, which consisted of a fresh banana that was flambéed in dark rum and brown sugar – sinful yet irresistible. Then I went inside to talk to Stephanie Price, who together with her parents Gordon and Sandy, created the Dam Pub. Even her daughter sometimes works here, making this pub a three-generation family affair. Stephanie told me a bit of the story of how this pub came into being. Gord and Sandy had been living in Scotland, the home of their ancestors, when family ties brought them back to Canada. They decided to open a traditional Scottish whisky pub, together with their daughter Sandy, and when looking for a location they found an “old white house on the hill” for sale in Thornbury. Before they found this location, the logo of the Dam Pub, a kilted bagpipe-playing beaver (perfectly symbolizing Scotland and Canada) had already been designed and the name had already been chosen. After purchasing the property they found out that there was a dam just down river, and the river is of course the Beaver River. Lots of uncanny coincidences came together in the creation of the Dam Pub in Thornbury, which today carries more than 700 whiskeys and is one of the most popular eateries in Grey County. Gord, who is a retired Air Canada pilot, aircraft builder and an award-winning aerobatic flyer, can quite often be seen flying over Thornbury, with a big sign promoting the Dam Pub. An enjoyable meal on the sunny patio at the Dam Pub and the success story of the Price family made for a great end to our first day in Grey County.